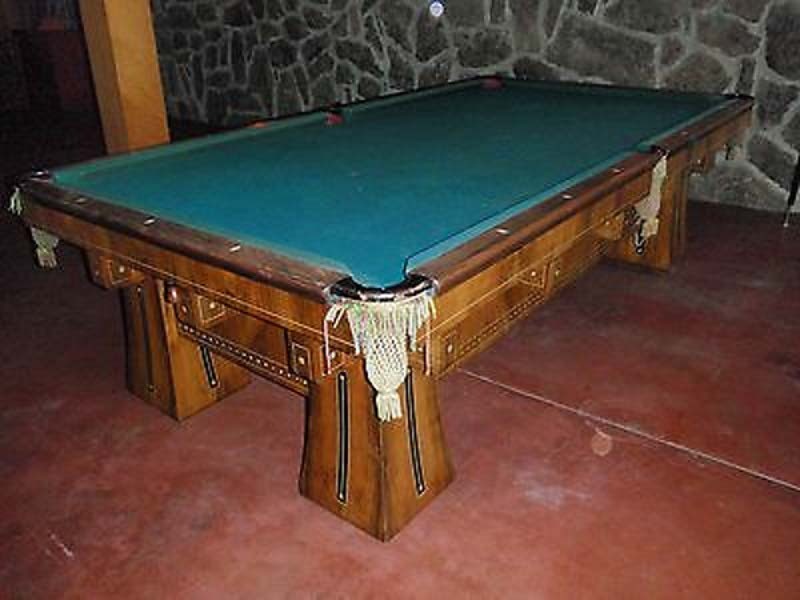 “Go BIG!” with this beautifully massive antique 10’ Brunswick-Balke-Collender Kling billiard table. Inspired by both the classic Greek and ancient Egyptian eras, this pool table perfectly combines magnificent design with brute strength, making it of the highest class of billiard tables for both construction and ornamentation. As previously mentioned, the Kling’s massive structure has what is known as the “Jumbo” framework, which means it is extremely heavy and substantially sized. But don’t let that scare you – the Brunswick-Balke-Collender Kling is also very finely detailed, with beautiful inlaid decoration along the sides as well as on the legs. 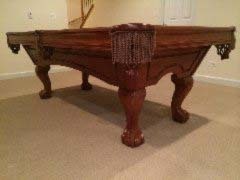 The table itself is a gorgeous Mahogany, which is then hand rubbed to a dull polish. The Kling is further decorated with black and white holly and pearl inlay on both the aprons and the legs. When it comes to construction, the Brunswick Kling does not disappoint. The sides are compound construction, tongued and grooved, and then reinforced with 3-ply veneer. The legs are 12” square at the bottom and taper to 9” at the top where they are firmly secured into the framework by means of tongue and groove, as well as being doweled and reinforced by corner blocks. As with all Brunswick tables, you can be certain that all of the Kling’s joints are secure and its mitres are 100% accurate. Additionally, all corners and edges are smooth and true. The Brunswick-Balke-Collender Kling features top quality Vermont 3 piece 1” thick slate, for accurate game play and a smooth roll. The Kling’s cushion rails are also made up of compound construction, giving them greater overall strength and protecting them against climatic changes. 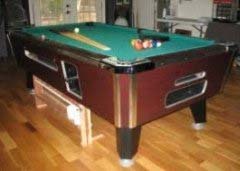 The corners are solid Rosewood, and the tops of the rails are decorated with ivory diamond-shaped sights and Brunswick’s signature fancy metal nameplate. 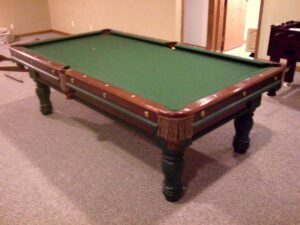 The rails are covered with the famous Match Game Perfect Angle cushions, which are actually made at a rubber factory locally in Muskegon, Michigan with a specialized formula exclusive to Brunswick. Pocket irons are No. 6 style, countersunk in the cushion rails, and covered in black leather. 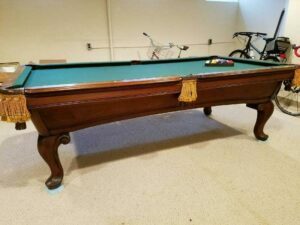 Overall, this beast of a table is both structurally sound and beautiful decorated and would likely be the conversation piece of your gameroom! Call us today for more information on the Brunswick-Balke-Collender Kling!